(Newser) – In 1912, an ambitious lawyer named Charles Dawson discovered a fossilized skeleton with the skull of a man but the jaws of an ape in a British gravel pit, the Telegraph reports. For the next three decades, Eoanthropus dawsoni—better known as Piltdown Man, named for the location it was discovered—was seen as an important step in human evolution, a "missing link" between apes and humans. 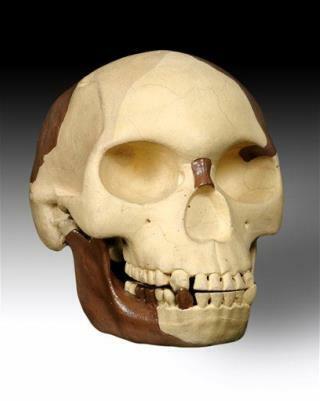 In reality, it was "arguably the greatest scientific crime ever committed in Britain," paleoanthropologist Isabelle De Groote writes in Scientific American. In a study published Wednesday in Royal Society Open Science, De Groote and her team believe they've finally solved once and for all who faked Piltdown Man by combining, carving, and dyeing human and orangutan bones. I find it funny that anti-theists criticize Christians for believing by faith, but what is it called if you have never seen proof of something yourself, but you accept the word of others? FAITH! Most anti-theists have never personally witnessed 90% of the scientific claims that they accept as fact. For example, none of them have ever witnessed amino acids self-organizing into complex proteins, which then self-organize into DNA, a cell-nucleus, a cell-wall, and other necessary cell-components just at the exact second that lightning (or some other spark) ignited them into a living organism. Yet they firmly believe that the first living organism self-organized with no intelligent designer, and then accidentally became alive. Since they believe it when no one has ever seen it, then it is believed by FAITH. We believe the testimonies of those who witnessed the resurrection of Yeshua of Nazareth because it is the most reasonable and most likely possibility (as opposed to some conspiratorial hoax). This also explains them being willingly put to death without admitting any fraud, which could have saved their lives. So, our faith is not a "blind" faith, but a reasonable faith, based on the evidence of the eyewitnesses and their lives following the resurrection. Mike with nothing behind in the picture as Elizabeth has stuff behind her in her picture evolution is from the Creator Lord Stratos the guy who made it all. The cells evolving to a higher life form talking to each other is termed 'Panthem'. That a dream, the Creator not. He may not be the only one so I could maybe be in error? Scams from Bible, to Science!